Skylum has been promising this major upgrade to its clever Luminar photo-editing software for so long, we’ve all been tapping our fingers! 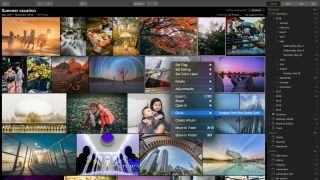 This Luminar 3 releases adds a new Library panel for viewing, organising and sorting photos. It will work alongside the existing Luminar editing tools to provide a much more complete photo-editing solution. Previously, Luminar relied on other tools for locating and organising photos, so this will be a big step forward for fans of this rather clever photo editing and effects software. Skylum promises fast browsing and organising with no separate 'import' process. The new Library panel organises photos by date and offers albums, ratings and labels to keep your ever-growing photo library in order. There’s no separate import process as simply browsing a folder adds it to Luminar’s library. The editing tools are non-destructive (hence reversible) and you can apply the same ‘look’ across many different photo simultaneously. Skylum is proud of its AI technologies, including its new AI Sky Enhancer filter. Luminar comes with over 50 preset ‘looks’ which are created using various combinations of adjustable Filters. You can choose and adjust these Filters manually if you want to edit your photos from scratch, and Luminar works well for both regular image enhancements, like curves or colour adjustments, and for special effects. If you find yourself using the same combination of Filters repeatedly, you can create a custom Workspace which displays just these filters. Luminar’s also a bit more powerful than it looks. You can add adjustment layers and masks for when you want to adjust specific areas in your photos, and you can even add other images as layers to produce composite images – such as adding a new and more interesting sky to a landscape shot, for example. Skylum is also very proud of Luminar’s growing use of AI technology, with its Accent AI automatic enhancement filter and new AI Sky Enhancer. Just to recap, this is a free update for existing users of Luminar 2018. Otherwise, you can pre-order Luminar 3 at a special price of $59/€59/£53 up until the official December 18 launch date. After that, it reverts to its regular price of $69/€69/£64. You can also upgrade from other Skylum products including Aurora HDR, Photolemur and legacy products for $49/€49/£44 (until December18).